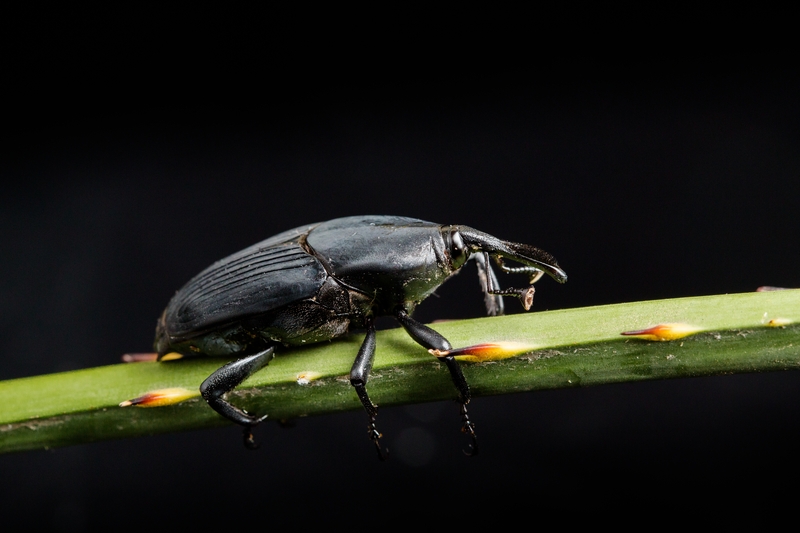 One of Los Angeles' quintessential icons - palm trees - are being threatened by an invasive pest from overseas - the South American palm weevil. KQED Science produced a clever overview on the life and times of this devastating pest, punctuating it with a surprise ending that features UC Cooperative Extension specialist Mark Hoddle. The story outlines the pest's life cycle, which starts when a female lays its eggs in the crown of a palm. They hatch and larvae eat the plant from the inside out, eventually killing the palm. The larvae pupate, complete metamorphosis, then fly off to find another palm to attack. Hoddle conducted an experiment to determine how far the weevils can fly. He glued the pest on a sort of insect treadmill and let it fly in circles. He found that they can travel up to 15 miles a day, enough to easily hopscotch from palm to palm on their own and spread widely. The biocontrol scientist demonstrates one way to get rid of South American palm weevils. If you're not squeamish you can view the video on the KQED website.